This recipe for risotto with asparagus and green peas is worth the effort of the attention and stirring, delivering its creamy and warm deliciousness in just about half-an-houir. If using low-sodium or unsalted stock, increase amount of salt for the rice to ¾ teaspoon. As always, taste for seasoning before serving, though.. Per Serving: 310 calories; 14g fat; 29.3g carbohydrates; 11g protein; 30mg cholesterol; 623mg sodium. 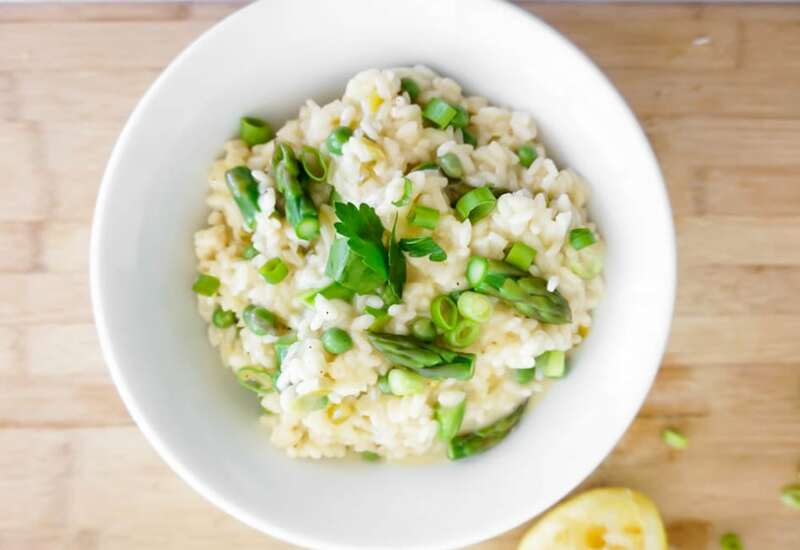 I love arborio rice and found this recipe to be really creamy, delicious, and flavorful. i used low sodium sock so I added a little extra salt as the recipe suggested, but I think it would have been fine even if I didn't. This is a great side dish to any meat. If you're feeling good, go a little crazy with the Parmesan cheese! I loved the way this turned out, the risotto was creamy and delicious. Overall it was really simple and easy to make, and the asparagus was a nice addition.